1) A street sweeper and some people will come through and clean your street. Please have any parked cars off the street, so the cleaning crew can do a thorough job. 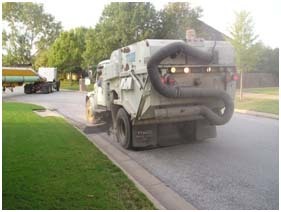 4) The crew resurfacing streets may not arrive for several hours. 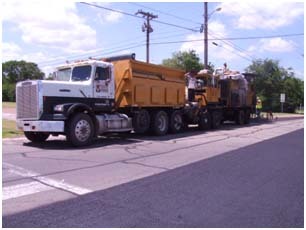 Please do not assume that the resurfacing will not occur if you don't see someone working on the street early in the morning. Several other street are being resurfaced throughout the day, and yours may not be first on the list. 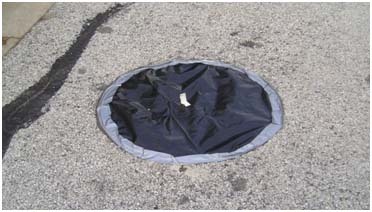 5) Yellow and black paving equipment will enter the street to begin resurfacing. By now your vehicles should be moved to an adjacent street if you will need to leave during the daytime hours! 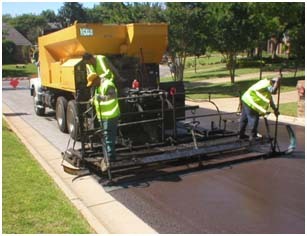 6) Your street has been resurfaced with microsurfacing / slurry seal. 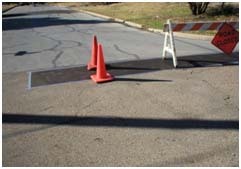 The material placed on your street is sticky when initially placed. It will stick to your shoes, tire, paint, and pets. Please stay off the street while the material is allowed to cure (dry). 7) People will return by the end of the day to uncover the utility access points and remove the cones and barricades blocking your street. At this time the material is cured and may be walked and driven on. 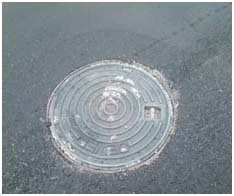 The cured microsurfacing / slurry seal material is no longer sticky. It will not get in your tires, shoes, or driveway.